Washington, DC — Today, on the 100th anniversary of Nelson Mandela’s birth, Property of the People is making all documents about Mandela obtained through it’s FOIA litigation from the FBI, CIA, DIA, and NSA available to the public. Spanning thousands of pages, the vast majority of these documents have never before been seen by the public. For his role coordinating the movement to end apartheid in South Africa, Nelson Mandela was arrested in 1962, ultimately serving 27 years in prison. Though Mandela was freed in 1990, Mandela remained on the U.S. terror watchlist until 2008. Despite long standing public knowledge of U.S. intelligence agency assistance to apartheid South Africa, and likely involvement in Mandela’s 1962 arrest in particular, little specific public information exists on these crucial matters. Shortly after Nelson Mandela’s death in 2013, MIT PhD candidate and Property of the People president, Ryan Shapiro, filed a Freedom of Information Act (FOIA) lawsuit against the Central Intelligence Agency (CIA), the Federal Bureau of Investigation (FBI), the National Security Agency (NSA), and the Defense Intelligence Agency (DIA) for records on agency efforts to counter Mandela and his movement for racial justice in South Africa. Shapiro’s FOIA lawsuit, which remains ongoing, has forced the intelligence agencies to release thousands of pages of illuminating documents. Shapiro has made a portion of these documents available to the public, resulting in extensive press coverage of FBI efforts to surveil and subvert Nelson Mandela and his struggle for racial justice. Some highlights of these documents are provided below. Ryan Shapiro is a PhD candidate at MIT, a former research affiliate at the Berkman Klein Center for Internet & Society at Harvard, and co-founder and president of Property of the People. Politico has called Shapiro “a FOIA guru at the Massachusetts Institute of Technology.” Shapiro is an historian of national security, the policing of dissent, and governmental transparency. Shapiro’s pathbreaking FOIA work has already led the FBI to declare his MIT dissertation research a threat to national security. Shapiro is on twitter @_rshapiro. Property of the People and Shapiro are represented by Washington, DC-based FOIA specialist attorney Jeffrey Light assisted by Property of the People staff attorney, Gunita Singh. Tagged Centennial, CIA, DIA, DOD, FBI, FOIA, Madiba, Mandela Day, nelson mandela, NSA, Property of the People, ryan shapiro. [CAMBRIDGE, MA] As revealed in an exclusive report by Jason Leopold for Al Jazeera America, Massachusetts Institute of Technology (MIT) PhD candidate Ryan Shapiro has received a second batch of documents from the FBI as part of Shapiro’s Freedom of Information Act (FOIA) lawsuit for records on Nelson Mandela. In the wake of recent NSA and FBI spying revelations, the documents obtained by Shapiro shed light on decades of politically motivated FBI surveillance, including the monitoring of Mandela’s post-prison meeting with a Yugoslavian President and the surveillance of Mandela’s meetings with activists in the USA. The first batch of documents, received by Shapiro last month, exposed FBI spying on Mandela during his historic 1990 visit to the U.S. shortly after his release from 27 years in prison for anti-apartheid activities. 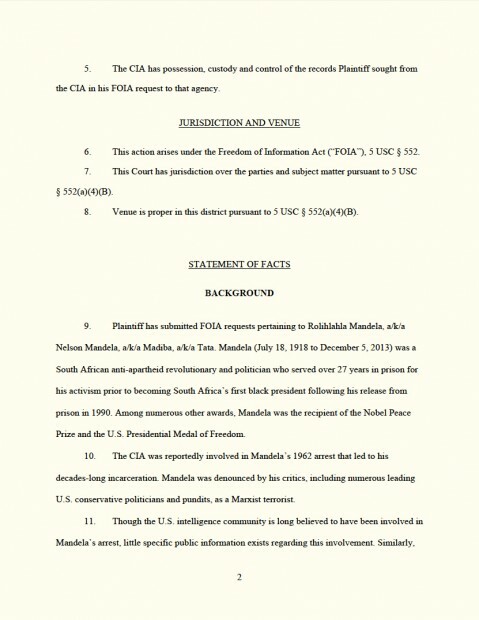 The newly released second batch of documents provides additional evidence of FBI monitoring and surveillance of Mandela’s activities, both prior to and following his release from prison. This included FBI monitoring of Mandela’s meetings with world leaders. Further, the newly released documents also reveal FBI investigation of the South African and U.S. anti-apartheid movements as being Communist threats to American domestic security. Notably, these FBI “Communist” threat investigations of the anti-apartheid movement continued even after U.S. imposition of trade sanctions against apartheid South Africa, after Mandela’s release from prison, and after the fall of the Berlin wall. Shapiro, a FOIA specialist, is an historian of the political functioning of national security and the policing of dissent. His pathbreaking FOIA work has already led the FBI to declare his MIT dissertation research a threat to national security. Shapiro is also suing the NSA, CIA, and DIA over those agencies’ failure to comply with his FOIA requests for records on Mandela. Shapiro is represented by FOIA specialist attorney Jeffrey Light. 1. The FBI monitored Mandela’s meetings with a foreign world leader and spied on his meetings with domestic U.S. dissidents. In the first release of documents to Shapiro, we learned that although the FBI assisted in protecting Mandela on his 1990 U.S. visit, the Bureau also took that opportunity to spy upon the newly freed iconic anti-apartheid leader. Those documents revealed the FBI developed a confidential informant within or closely affiliated with Mandela’s U.S. entourage, and this informant provided the FBI not only with logistical information about Mandela, but also political information about Mandela and his associates. The newly released second set of documents reveal further politically-motivated FBI monitoring and surveillance of Mandela upon his release from prison, including the monitoring of a meeting between Nelson Mandela and a foreign world leader. For example, in a newly released March 1990 document that is still largely classified “Secret,” the FBI is shown to have monitored[.pdf ] a meeting in Namibia between Mandela and Janez Drnovsek, then president of Yugoslavia and leader of the Non-Aligned Countries. The Non-Aligned Countries Movement was deeply supportive of Mandela and his anti-apartheid political party, the African National Congress (ANC). 2. The FBI monitored Mandela even before his release from prison. 3. The FBI investigated the South African and U.S. movements to end apartheid and free Nelson Mandela as Communist plots. 4. The FBI understood these anti-Apartheid purported communist plots to be threats to American national security. The 100 classification signifies an FBI “Domestic Security” investigation. Not only do FBI “Domestic Security” investigations definitionally pertain to FBI investigations of perceived security threats, the 100 classification was the primary classification used by the FBI during its notorious and ultimately deemed to be unconstitutional COINTELPRO campaigns (see below) against the U.S. civil rights, free speech, and anti-Vietnam War movements, among others. The 229 investigation classification signifies an FBI “Foreign Counterintelligence Matters” investigation. Several of the newly released documents also bear the “G-3” security code classification, which also signifies a Foreign Counterintelligence Investigation. Traditionally, counterintelligence entails the prevention of espionage, however the FBI has historically used term to mean spying on and disrupting political dissidents. The most obvious example is the FBI’s infamous COINTELPRO, or COunter INTELigence PROgram, in which the FBI unlawfully surveilled, infiltrated, and at times violently disrupted anti-war, civil rights, and other American political dissident movements. COINTELPRO targets included Martin Luther King, the National Association for the Advancement of Colored People (NAACP), Muhammed Ali, Students for a Democratic Society (SDS), and the National Lawyers Guild. 5. The FBI’s understanding of the anti-apartheid movement was so warped, one FBI field office felt compelled to internally refute the FBI’s distorted facts and analysis on the subject. 6. As with the previous release, the FBI has again withheld a huge amount of information, and the NSA, CIA, and DIA have yet to release any documents at all. Not only did the FBI withhold some pages in their entirety from this release, many of the records the FBI did release are heavily redacted. One such document, a still largely classified “Secret” 1993 NY FBI foreign counterintelligence memo pertaining to Mandela, involved a confidential informant who explicitly “provided [the FBI] political information[. ]” [.pdf ] Additionally, The FBI justified its redactions and withholdings in this release in part by invoking FOIA exemptions pertaining to national security, the use of confidential informants, and perhaps most bizarrely, ongoing investigations. Further, while the FBI’s latest document release is definitely problematic, the NSA, CIA, and DIA have yet to release any documents at all regarding Mandela in response to Shapiro’s FOIA requests and lawsuit. And these are the agencies most likely to posses records pertaining to U.S. intelligence community involvement in pro-apartheid South African affairs prior to Mandela’s 1990 release from prison. U.S. involvement in these affairs, including the likely involvement of the CIA in Mandela’s 1962 arrest, and the confirmed provision by the NSA of intelligence to the apartheid regime into the 1980s, are deeply shameful. Tagged 1990, CIA, DIA, FBI, FOIA, Jason Leopold, nelson mandela, NSA, ryan shapiro. [CAMBRIDGE , MA] As revealed in an exclusive report by Jason Leopold for Al Jazeera America, Massachusetts Institute of Technology (MIT) PhD candidate Ryan Shapiro has received the first batch of documents from the FBI as part of Shapiro’s Freedom of Information Act (FOIA) lawsuit for records on Nelson Mandela. The released records largely deal with Mandela’s historic 1990 visit to the U.S. shortly after his release from 27 years in prison for anti-apartheid activities. Though what’s missing from these documents is often as illuminative as what’s disclosed, there’s still a lot here. 1. The FBI spied on Mandela during his first U.S. trip after release from prison. Although the State Department had primary responsibility for Mandela’s security on his 1990 U.S. visit, the FBI assisted in this task. And in addition to investigating threats made against Mandela, of which there were many (see below), the FBI also took this opportunity to spy upon the newly freed iconic anti-apartheid leader. Shortly before Mandela’s arrival, the FBI developed a confidential informant [pdf] within or closely affiliated with Mandela’s U.S. entourage. This informant provided not only logistical information to the FBI, but also political. This included information regarding a prospective meeting with Louis Farrakhan, as well as the identities and recent travels of African National Congress (Mandela’s political party which was at that time still officially considered a terrorists organization by the U.S. government) leaders in the U.S. Notably, the released documents also show the FBI began clipping press articles about Mandela immediately upon Mandela’s release from prison. The FBI did this as part of a “247” investigation, which pertains to foreign counterintelligence matters. Traditionally, counterintelligence entails the prevention of espionage, however the FBI has historically used term to mean spying on and disrupting political dissidents. The most obvious example is the FBI’s infamous COINTELPRO, or COunter INTELigence PROgram, in which the FBI unlawfully surveilled, infiltrated, and at times violently disrupted anti-war, civil rights, and other American political dissident movements. COINTELPRO targets included Martin Luther King, the National Association for the Advancement of Colored People (NAACP), Muhammed Ali, Students for a Democratic Society (SDS), and the National Lawyers Guild. 2. Mandela was the target of numerous death threats on his 1990 trip to the U.S.
3. The FBI has withheld a huge amount of information from this release, and the NSA, CIA, and DIA have yet to release any documents at all. In this release, the FBI provided Shapiro with 334 pages of documents on Mandela. However, the FBI withheld in their entirety another 169 pages of responsive records. Further, many of the records the FBI did release are heavily redacted. Some of them, such as this document [pdf], are so heavily redacted as to be ludicrous. The FBI justified these redactions and withholdings in part by invoking FOIA exemptions pertaining to national security and the use of confidential informants. Further, while the FBI’s document release is definitely problematic, the NSA, CIA, and DIA have yet to release any documents at all regarding Mandela in response to Shapiro’s FOIA requests and lawsuit. And these are the agencies most likely to posses records pertaining to U.S. intelligence community involvement in pro-apartheid South African affairs prior to Mandela’s 1990 release from prison. U.S. involvement in these affairs, including the likely involvement of the CIA in Mandela’s 1962 arrest, and the confirmed provision by the NSA of intelligence to the apartheid regime into the 1980s, are deeply shameful. Tagged 1990, CIA, Corretta Scott King, FBI, FOIA, nelson mandela, NSA, ryan shapiro. [WASHINGTON, DC] Massachusetts Institute of Technology (MIT) PhD candidate Ryan Shapiro filed a lawsuit this morning against the National Security Agency, the Federal Bureau of Investigation, and the Defense Intelligence Agency over the spy agencies’ failure to comply with his Freedom of Information Act (FOIA) requests for records on anti-apartheid activist and South African President, Nelson Mandela. Shapiro’s requests seek, among other records, documents pertaining to the U.S intelligence community’s role in Mandela’s 1962 arrest and Mandela’s placement on the U.S. terror watch list until 2008. Shapiro is already suing the Central Intelligence Agency over this same failure. Shapiro wants to know why the NSA, FBI, DIA, and CIA viewed Mandela as a threat to American security, and what actions the Agency took to thwart Mandela’s efforts to secure racial justice and democracy in South Africa. Shapiro, a FOIA specialist, is an historian of the political functioning of national security and the policing of dissent. His pathbreaking FOIA work has already led the FBI to declare his MIT dissertation research a threat to national security. Shapiro is represented by FOIA specialist attorney Jeffrey Light. 1) Despite longstanding public knowledge of definite (if undefined) U.S. intelligence assistance to apartheid South Africa in general, and likely involvement in Mandela’s 1962 arrest in particular, much of the U.S. and world press has paid distressingly little attention to these issues. Even in the wake of Mandela’s death, these issues, including the fact that Mandela remained on the U.S. terror watch list until 2008, have for the most part remained ignored or discounted. In addition to beginning to fill these massive holes in public knowledge of U.S. intelligence operations, Shapiro’s FOIA efforts will bring much-needed attention to these vital topics, as well as to the U.S. intelligence community’s continued outrageous aversion to transparency. “Though the U.S. intelligence community is long believed to have been involved in Mandela’s arrest, little specific public information exists regarding this involvement. Similarly, though the U.S. intelligence community is long known to have routinely provided information to the South African regime regarding the anti-apartheid movement, little specific public information exists about these activities either. Further, despite now being universally hailed as a hero and freedom fighter against gross injustice, Mandela was designated a terrorist by the United States government and remained on the U.S. terror watch list until 2008. “Democracy cannot meaningfully exist without an informed citizenry, and such a citizenry is impossible without broad public access to information about the operations of government. Secrecy is a cancer on the body of democracy. The Bush administration initiated a disastrous welter of anti-transparency initiatives, yet the Obama administration has been, if anything, worse. Despite entering office promising unprecedented openness, the Obama administration has provided just the opposite, including bringing more Espionage Act prosecutions of whistleblowers than all previous administrations combined, and invoking “national security” to deny FOIA requests “more than ever.” FOIA is broken, and this sad reality is just one component among many of the ongoing crisis of secrecy we now face. Building upon the Pentagon Papers ruling, we as a nation need to foster a broader understanding of “national security.” In the interest of preserving the national security borne not of secrecy and state surveillance, but rather of the free exchange of ideas made possible by “our free institutions,” I call upon all persons with access to unreleased records pertaining to illegal, unconstitutional, or immoral government activities to return those records to their rightful owners, the American people. Tagged apartheid, CIA, DIA, FBI, National Security, nelson mandela, NSA, ryan shapiro, Whistleblowers. [WASHINGTON, DC] Massachusetts Institute of Technology (MIT) PhD candidate Ryan Shapiro filed a lawsuit this morning against the Central Intelligence Agency over the spy agency’s failure to comply with his Freedom of Information Act (FOIA) request for records on recently deceased anti-apartheid activist and South African President, Nelson Mandela. Shapiro wants to know why the CIA viewed Mandela as a threat to American security, and what actions the Agency took to thwart Mandela’s efforts to secure racial justice and democracy in South Africa. Shapiro, a FOIA specialist, is an historian of the policing of dissent and the political functioning of national security. His pathbreaking FOIA work has already led the FBI to declare his MIT dissertation research a threat to national security. Shapiro also has FOIA requests for records on Mandela in motion with the Federal Bureau of Investigation, the Defense Intelligence Agency, and the National Security Agency. Shapiro is represented by FOIA specialist attorney Jeffrey Light. 1) The CIA is widely and credibly believed to have been involved in Mandela’s 1962 arrest that led to his decades-long incarceration. Yet, the Agency has never admitted its role in this affair, and little specific public information exists on the matter. Shapiro’s FOIA efforts will begin to fill this massive hole in public knowledge of U.S. intelligence operations. 2) Despite longstanding public knowledge of U.S. intelligence assistance to apartheid South Africa in general, and in Mandela’s arrest in particular, much of the U.S. and world press has paid distressingly little attention to these issues. Even in the wake of Mandela’s death, these issues, including the fact that Mandela remained on the U.S. terror watch list until 2008, have for the most part remained ignored or discounted. Shapiro’s efforts will bring much-needed attention to these vital topics, as well as to the U.S. intelligence community’s continued outrageous aversion to transparency. “Though the U.S. intelligence community is long believed to have been involved in Mandela’s arrest, little specific public information exists regarding this involvement. Similarly, though the U.S. intelligence community is long understood to have routinely provided information to the South African regime regarding the anti-apartheid movement, little specific public information exists about these activities either. Further, despite now being universally hailed as a hero and freedom fighter against gross injustice, Mandela was designated a terrorist by the United States government and remained on the U.S. terror watch list until 2008. You can read the full text of today’s court filing against the CIA HERE. Tagged aparthied, CIA, DIA, FBI, FOIA, lawsuit, nelson mandela, NSA, ryan shapiro, south africa, terrorism.